Life As We Knew It meets Lord of the Flies in a mall that looks just like yours. A biological bomb has just been discovered in the air ducts of a busy suburban mall. At first nobody knows if it's even life threatening, but then the entire complex is quarantined, people start getting sick, supplies start running low, and there's no way out. Among the hundreds of trapped shoppers are four teens. These four different narrators, each with their own stories, must cope in unique, surprising styles, changing in ways they wouldn't have predicted, trying to find solace, safety, and escape at a time when the adults are behaving badly. This is a gripping look at people and how they can--and must--change under the most dire of circumstances. And not always for the better. 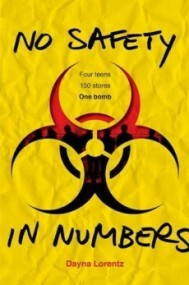 No Safety In Numbers by Dayna Lorentz was a chilling contemporary novel that was enticing til the last page. It was a promising start to the trilogy and I am anxious to see where the story goes from here on out. No Safety In Numbers is told from four different points of view, which was a lot of fun to read. You really got a lot of different views on the same situation and saw how all the characters paths crossed. The plot was really intriguing and was a bit freaky, as there was that realistic factor - this COULD still happen. My one complaint would be that the novel took a very slow pace - some parts seemed to drag a bit. I really liked the characters - they were definitely the strongest part of No Safety in Numbers. The four main characters all felt very much like real teenagers. Shay was definitely my favorite character of the book - she was the most down to earth character and was a book worm, which I can totally relate to :). A few characters decisions seemed a bit off at times for me, but then again, they're in this crazy situation. No Safety in Numbers by Dayna Lorentz is a book you need to stick with. It was a great book with a bit of an eerie story, but it does go by at a slower pace. The book ends on a high note with all the characters, and I really am curious to see where Dayna Lorentz takes her characters next.